Among enthusiasts, it’s well known that rye whiskey makes a better Manhattan. I’ve recently discovered that it makes a better Kansas City, too. 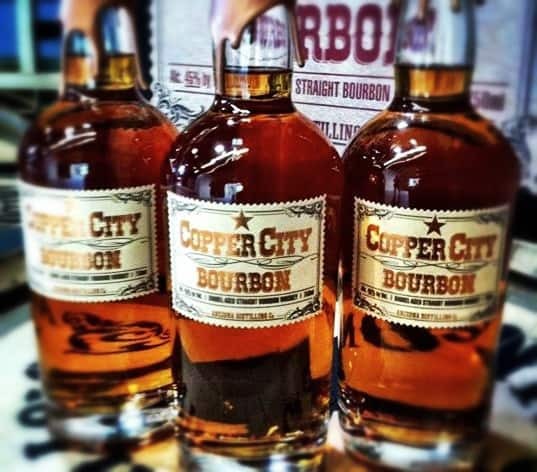 There’s a distillery there making a rare and wonderful thing. My whiskey travels took a literal turn with a long-overdue trip to Kansas City to visit my in-laws. For us, KC means family reunions and great barbecue. This time, however, our trip afforded me an unexpected opportunity to sample another local must-try, 100% rye whiskey. So I decided to come up for air from beneath my mountain of pork spare ribs and check it out. 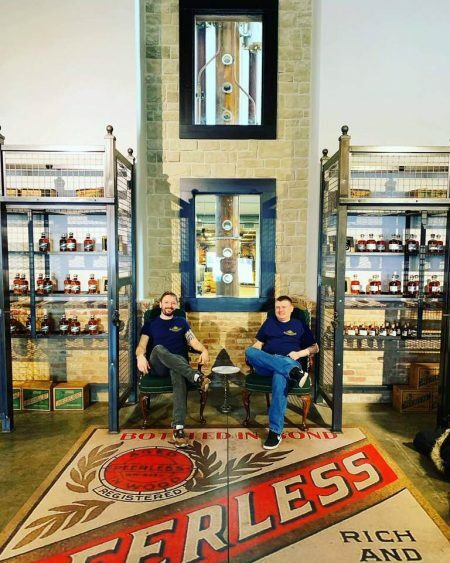 Inside an unassuming building in an unassuming office park in the unassuming town of Lenexa, Kansas, so close to KC proper you can practically wave at them from across the state line, you’ll find Dark Horse Distillery, an enterprise dedicated to two important things: family and great whiskey. Why Kansas and not Missouri? They’ve relaxed their liquor laws in Kansas, making it much easier to set up shop. I stole away one day for a private tour of this family-operated distillery, primarily to sample its Reunion Rye, one of the very few rye whiskeys out there made entirely of rye grain. Usually rye is mixed with corn or barley to help the fermentation process but the Garcia siblings go the extra mile needed to keep things pure. The four siblings, three brothers and a sister, decided they wanted to go into business together as a family. After researching the art and science of distillation, they opened Dark Horse Distillery in 2010, and got business rolling with a vodka and a white whiskey. 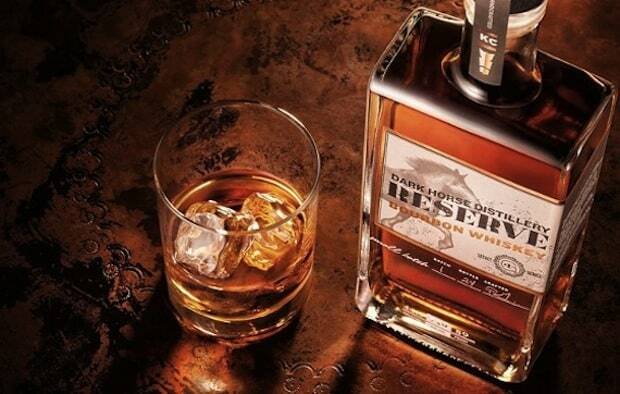 In March 2013 they released their Reserve Bourbon and Reunion Rye. As soon as Damian Garcia, the sales and marketing director, leads me into the 26,000 square foot place a pleasant yeasty aroma welcomes me. On one side is a glass-enclosed distilling room in which their large hand-made Vendome copper pot, “Chester Copperpot,” presides over ten 500-gallon fermenters. Nearly surrounding the distilling area are several large beautifully-appointed rooms ready to be rented out through Mary Garcia as venues for everything from wedding receptions to corporate events. This is a micro-distillery cranking out about 250 proof gallons of spirit a week. Master distiller Patrick Garcia oversees a process that starts from scratch. The grains they use in their rye and bourbon are locally sourced. Run your hand through it and you get almost no dust compared to the dirt, twigs and bugs you might find sticking to you from lesser quality grains. This is also one of the few distilleries that grinds its own, in a separate mill room outfitted with explosion-proof lights. Grain dust, it seems, is no-joke flammable. “It’s all about taste, sight and smell,” Patrick explains. “We’re not using computers here.” Doing things at the micro-level means that he has more control over what’s going on. “We cut short on the tails and use 10% of the hearts. The heads are redistilled to extract even more hearts. Pure ethanol gets put into those barrels so the taste is pure.” For five days they monitor the mash’s temperature while the yeast does its magic. Their hydrometer helps them keep tabs on temperature and proof, holding levels where they need to be to coax forth the right flavors. Come barreling time, the whiskey goes in at 120 proof. Distilled water is then added to get it down to 89 proof. Out of a 10,000 pounds of grain they get roughly 50 gallons per distillation. I thrill at the chance to taste the clear spirit as it first begins climbing up the tube. This is the head, and while it’s not what you’re after it’s not terrible– much like white whiskey, sort of sweet and flora . As the temperature rises, the heads eventually go away and the hearts start coming through. A taste of that is a fun surprise as here is proper whiskey being born. After collecting the hearts, the heads get run back through to coax more hearts out of it. Once Patrick decides that the taste and smell are just right, the whiskey gets barreled and the spent grains are sent off to a local dairy farm as feed for the cows. The rising tide of popularity in eating and drinking “local” that has swept through the coasts is now seeping into the heartland. Dark Horse not only locally sources its grains for all its spirits it uses barrels made from Missouri oak, considered one of the finest wood for the job. At the moment, they age most of their whiskey in small 30-gallon barrels which feature a grooved honeycomb pattern inside, allowing for more surface area to be in contact with the spirit for faster aging. General manager Eric Garcia joins us among the barrels to explain that this warehouse is not climate-controlled, allowing the wood to expand and contract with the changing climate, affecting the taste in its own unique way. I imagine rows of barrels breathing slowly and deeply in the dark. Once the whiskey completes its third year of aging, it’s off to the bottling room where every bottle is filled by hand amid shelves lined with satisfyingly square-shouldered bottles and boxes of real cork stoppers. Since the distillery itself is named after the family’s two horses, Chrome and Steel, they slap on labels featuring their images. Chrome on the bourbon and Steel on the rye. Once they’re corked, Patrick himself signs each bottle. We finished the tour with some sampling, and there’s a reason why I’m now a convert to the taste of pure rye. Color: amber. Nose: vanilla, with a hint of the saddle. In the Mouth: With the first sip, butterscotch and caramel ride in first, but that lovely black peppery rye soon catches up to gallop along side it for the long finish. On the second sip the bready flavors of rye come through along with another heavy dash of pepper. I can’t get enough of that pepper. I want to drink this from a flask as I herd cattle along the Chisholm Trail to the Kansas City railheads carrying saddle bags stuffed with barbecued pork ribs. It could happen, you never know. I finished my trip to KC with a bottle of Reunion Rye purchased at Berbiglia’s, a local liquor store — because you can’t get it online just yet (but they’re working on it) and, at the moment, you can’t get it outside of Kansas and Missouri (they’re working on that, too). Once they do, I highly recommend it at $40 a bottle — here’s an excellent sipping and cocktail-making rye whiskey that reflects a lot of family pride. Such a good writer———–and bourbon aficionado!